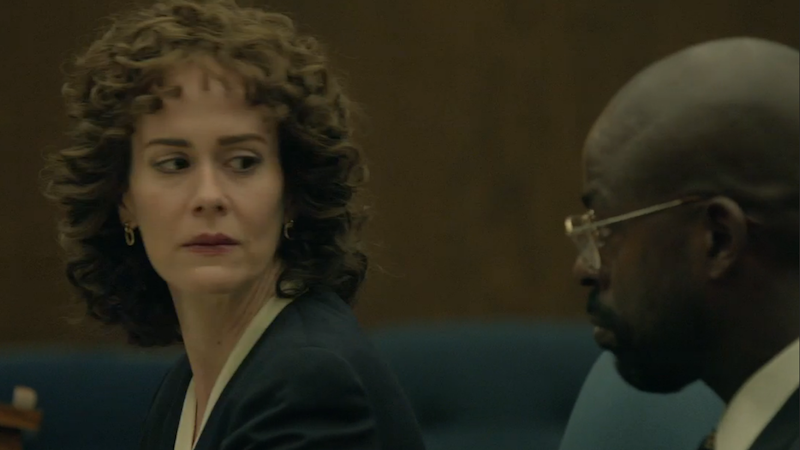 On TV at least, the flirty chemistry between Marcia Clark and Christopher Darden appears undeniable. Tuesday night’s episode of The People v. O.J. Simpson: American Crime Story brought the pair even closer, but was there really a relationship or not? The answer is maybe and probably. The series has so far floated the idea of a fling between Clark (Sarah Paulson) and Darden (Sterling K. Brown) in bits and pieces, including a dance scene in the office and an almost adolescent puppy love moment the two share outside Clark’s hotel room where it looks like they’re both thinking of kissing. Clark only confirms that they danced and Ellen continues her pursuits. “We did take a trip to the Bay Area,” says Clark. Fact of the matter is, Chris Darden and I were closer than lovers. And unless you’ve been through what we went through, you can’t possibly know what that means. ...Why not have a relationship with Marcia? She was attractive and I was impressed by her intelligence and toughness, intrigued by her vulnerability. We were working together as many as fifteen or sixteen hours a day, watching each other’s backs in court and commiserating over the media and other things that no one else understood.